The mission: Use no plastic shopping bags. It’s been almost a year and I’m pretty successful. The item: Box of tampons. My cashier was scanning the items in my order and putting them in my cloth shopping bag, emblazoned with a competitor’s logo. (I prefer to bag things myself but he grabbed it from me.) When the bag was mostly full, he put an item in a plastic shopping bag. Before, while, and after he was doing this I asked him not to. I did NOT want a plastic shopping bag. (Okay, I sound weird. But I mean it.) There was room in the bag. He insisted and put the plastic shopping bag containing the item in my reusable bag. I took it out and took the item out: a box of tampons. He explained There’s poison in that. Excuse me? Do you know what I plan to do with these? I said they were all cotton. (The box says cotton/rayon, but I don’t think that qualifies as poison.) Does this guy have some sort of Oedipal complex? Does he have stock in the Diva Cup? Is it like that thing my mom has about no food in the bathroom? I can only hope he mistook the box for a pesticide or something, and yes, he’s probably trained not to put that in the same bag as the fruit and veggies. But I would have tossed it in there anyway, and I was annoyed that he wouldn’t listen to me. Don’t worry, I put the bag back on the rack so someone else can use it. And I let the tampons comingle with my apples! My evidence of a high score on Pitfall to send to some magazine. 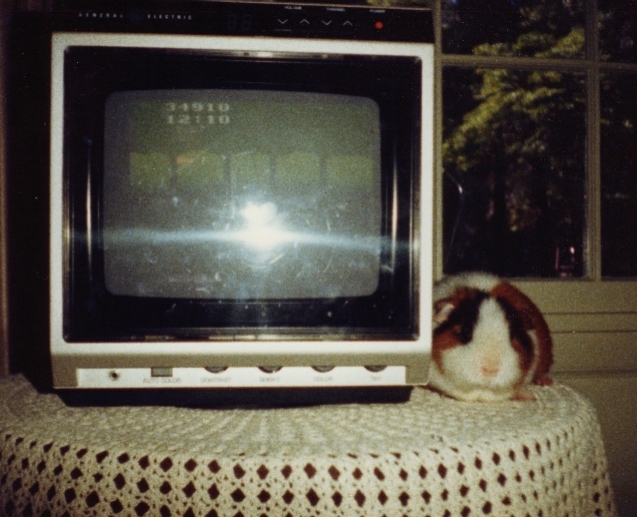 I put my guinea pig Frisky in the scene to make it better. For the life of me, I cannot find the blog discussion about this… anyone know who was talking about it a few months ago? This entry was posted in Completely random, Family, Pets/Rescue, Save the planet by Amy. Bookmark the permalink. That cashier sounds like a nutbar! Love that boombox costume – would be fun to recreate. I think that’s Saran Wrap in the tape player area! The costume doesn’t look very ergonomically friendly.